Our playgroups offer you an opportunity to have parent-child interaction and a chance to meet other families. While you are at playgroup you will have times you sing songs, have finger plays, play in the gym and many more things. Playgroups integrate all age groups and are offer at different sites. 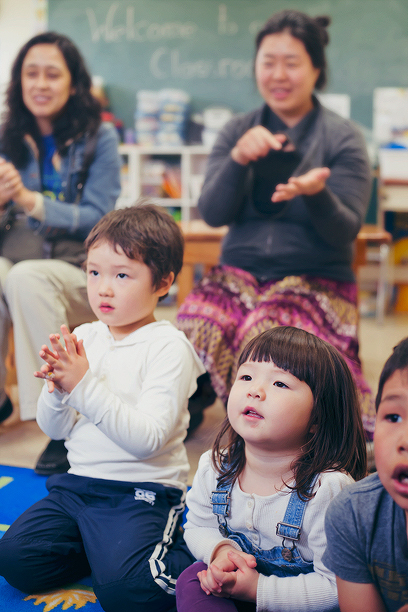 This is a wonderful time for you and your child to enjoy songs, dance, stories, rhymes, and art! If your child is 3-5 years old and you want to meet new people drop by for a visit! Childcare is available for younger siblings. Do you have a new baby and want to connect with other moms? Come on out to our Baby & Me group. This group is a great place to connect with other moms and babies and share stories. During Baby & Me we do some Infant Rhyme Time which teaches you and your child songs and rhymes you both will love as well as support and encourage each other. Childcare is available for your older children. Toddlers love to move and sing! Our toddler Rhyme Time will teach you and your child many new songs, rhymes, and movement activities. Come out and join us for a great parent-child experience. Does your toddler like to wiggle and jiggle, move and groove? If so, come on out to Toddler Tonics. You will enjoy a morning of physical activity, fun and it will be a chance for you to meet new families. This program is a parent – child interactive program and most suitable for children 18m-3 years of age. Would you like to learn great new recipes that are healthy and nutritious? Looking to prepare snacks and meals on a budget and things that your children will eat? Join us at Fun with Food to explore new recipes and to cook with your child. This is a parent – child interactive group and is most suitable for children that are 3 years and up.